Also, not seen in the photos, countless papers and some books. In the background, CD rack (old music, old collection) and a collage I had to do for school (it provides inspiration and I occasionally add new things to it). You're desk is so organized! 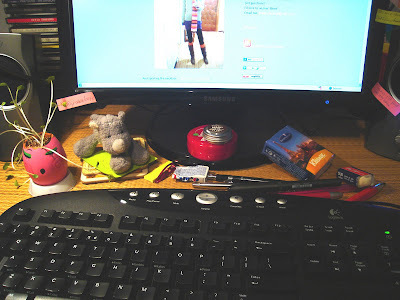 My working space is marked with clutters of randomness. Sweet Fancy Treat on Stiletto!